Successfully Added Xiaomi Mitu Building Blocks Mining Truck - 500 Pieces, High-Quality ABS, Environmentally Friendly, Mechanic Design to your Shopping Cart. If you have a creative son or daughter who loves to explore and learn new things in a fun way, the XiaomiMitu Truck is perfect for you. This remarkable toy truck is built-up out of more than 500 pieces of excellent ABS material. Every piece has been well crafted and features a highly precise finish for a smooth and easy building process. This truck offers tons of excitement to build together with your son or daughter. Once completed, it is a great toy for your child to play around with. Thanks to the extra strong anti-impact material of the ABS blocks, this truck is extremely durable and has been built to withstand a hit. It has furthermore been crafted out of eco-friendly materials that are safe to handle for your child. After assembling your toy truck, it has a compact and sleek appearance. It features an attractive mechanical appearance and has vivid bright colors that fascinate both young and old. Thanks to its mechanical design, this toy truck can do so much more than simply driving around. Your kids will be able to move its parts around, making it feel as if they are holding a miniature version of a real truck. 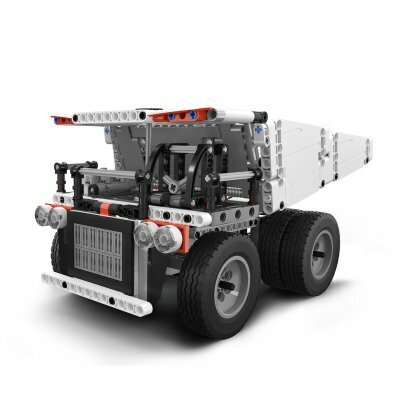 The design of this building block truck stimulates your child’s creativity and improves his hands-on ability. It will furthermore improve his patience and imagination. This educative toy is great fun to put together and play with for both young and old. It is guaranteed to bring hours’ worth of fun into the lives of every mechanical toy lover out there. The XiaomiMitu comes with a 12 months warranty, brought to you by the leader in electronic devices as well as wholesale toy trucks.